In this, the true Golden Age of Comics, our favorite super-heroes can appear in endless variations and in any number of storytelling platforms from the traditional comic book to cartoons, movies, TV shows, video games and prose novels. When the creators of these new stories adhere to the core values of these characters, the results can be entertaining and meaningful. This week, I’m reviewing Catwoman: Soulstealer by #1 New York Times Bestselling Author Sarah J. Mass [Random House; $18.99]. It’s even better than the Batman novel. 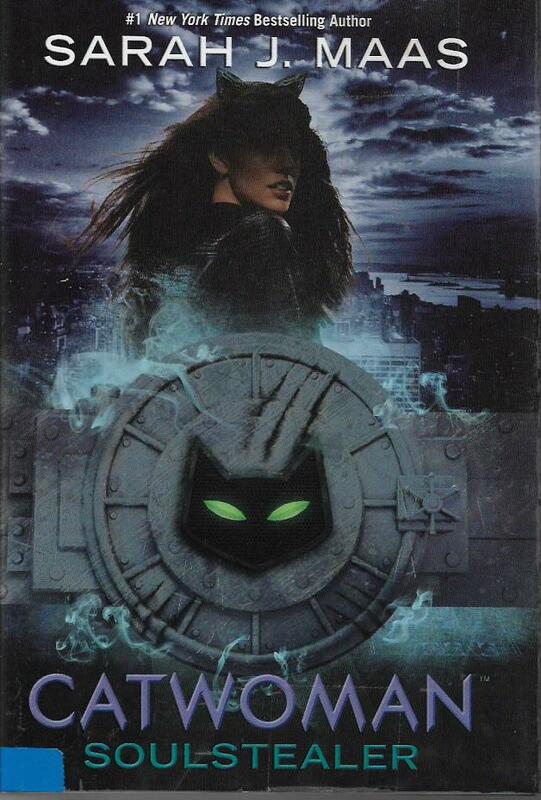 This novel features an alternate version of Catwoman. Running with a violent girl gang to provide for her sister Maggie, Selina trades her relative freedom to join the League of Assassins. The League’s end of the deal is to get Maggie into a good foster home where she can receive treatment for her multiple sclerosis. Years later, having created the new identity of wealthy socialite Holly Vanderhees, Selina has returned to Gotham to launch a series of daring robberies targeting the city’s richest citizens. With the Bat away on an extended mission, this cat will be playing with Luke Fox aka Batwing. In this re-imagination, Selina is a contemporary of Luke’s and also suffers from posttraumatic stress disorder. She from her days fighting for the pleasure of gangster Don Falcone and his cronies, he from his service in the Middle East. There are lots of familiar names in this novel. Poison Ivy. Harley Quinn. The Joker. Several of the deadliest assassins the League has to offer, assassins sent to find Selina, recover something she has stolen from the League and, the name of their group kind of being a dead giveaway, kill her as brutally as possible. Like the Batman novel, this one is a page-turning thriller. There is action. There is emotion, sometimes revealing itself in the most unexpected ways. There is heroism and sacrifice in a situation that is more grey than outright dark, even though things to get fairly dark on occasion. I love Catwoman: Soulstealer, and even though I also love the two other books I’m reviewing this week, this novel is my pick of the week. It’s a different kind of Catwoman story, but it’s one of the best. I recommend it to one and all. Having finished reading two of my all-time favorite manga series – Assassination Classroom and Princess Jellyfish – I have been on the hunt for new (or new to me) manga that delight me as much as those series did. 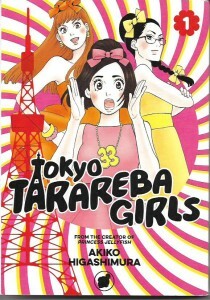 In my quest, I came across Tokyo Tarareba Girls Volume One by Akiko Higashimura [Kodansha Comics; $12.99]. Higashimura is the creator of Princess Jellyfish. Tokyo Tarareba Girls is a comedy aimed at young women in their late teens or somewhat older young women who have entered the job market and making their own way in the world. Clearly I don’t fit squarely into that demographic, but Higashimura is a skilled creator with a fun sense of humor. His work speaks to me. Our heroine is Rinko, a 33-year-old writer of romance teleplays who has never been married. Her career has gotten a little shaky, her love life is non-existent. Her leisure time is spend drinking with Kaori and Koyuki, her best friends since high school. On one such night, their loud complaints about men and their situations annoy a handsome man in the bar. He tells them they are “what if” women, constantly bitching about what might have been instead of trying to change their lives. Rinko vows to get married by the Tokyo Olympic Games in 2020. Rinko’s path crosses that of the handsome man at her job. It’s not a pleasant coincidence. But, even as Rinko takes some hits at work, the reader can’t help but hope to gets everything she wants out of life. I know I’m rooting for her. Tokyo Tarareba Girls is a seven-book series. I’m in for their whole ride. There has also been a ten-episode TV series, but I won’t seek that out until I finish reading the manga. If you’re into manga beyond the usual battle, horror, or science-fiction tales, I think you’ll enjoy Tokyo Tarareba Girls. For several years now, NBM’s ComicsLit imprint has been publishing an extraordinary series of original graphic novels in collaboration with the Louvre museum in Paris. The graphic novels are crafted by comics artists from around the world, each creating a story based on the museum and its many astonishing collections. Some of these are more fantastic than others. I have been reading these graphic novels as fast as my local library system can get them to me. Guardians of the Louvre by acclaimed manga artist Jiro Taniguchi [NBM; $24.99] is a hauntingly beautiful tale of a Japanese artist who comes to Paris, intending to visit all the great museums in the capital. He comes down with a fever and lies bedridden in a hotel room in a foreign-to-him land where he doesn’t speak the language. He gets the Louvre and gets lost in the huge crowds of visitors to the landmark. But, perhaps in delirium, he finds himself guided by the Winged Victory of Samothrace and having conversations with a succession of famous painters whose works hang in the museum. The conversations seem to take place in other places and other times, but the experience reflect the artist’s own struggle with a great loss in his own life. Some of the Louvre graphic novels are out of print. I would love to see NBM collect them all in an omnibus edition. I’d happily spend well over a hundred dollars for such an edition. 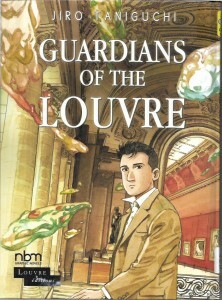 In the meantime, I urge you seek out Guardians of the Louvre and the other graphic novels in this series. My next convention appearance is the second annual Hall of Heroes Comic Con, Saturday and Sunday, September 8-9, in downtown Elkhart, Indiana. Sponsored by the Hall of Heroes Museum, this looks like a fun event with plenty of comics and media guests, presentations, gaming and cosplay. I hope to see you there.